The third permaculture ethic is Fair Share. It tells us to set limits on what we withdraw from the earth and to redistribute (share) the surplus. Nature is abundant. Even those environments that seem uninhabitable, when examined closely, are often full of plant and animal life uniquely suited to take what that place has to offer. But those plants and animals don’t take more than the environment can give. They live in a balanced system. We live in the same system but we’ve been able to ignore natural limits thanks to technology and trade. As we reach global limits of “peak water,” “peak oil” and peak mineral usage, we will no longer be able to over-reach. We must either replenish the system or bring our demands into balance with what nature can actually provide. I remember how shocked I was when one of my permaculture teachers told our class we should not give away our food but should instead think of composting it. How could he suggest we not share? Of course, what he really wanted us to look at was the idea of surplus. Did we get that surplus by overtaxing the soil? In a very real way, every bushel of corn and every sunflower seed that leaves our garden is water, soil, nutrients and sun energy leaving this space, depleted it. The sun energy is renewable but what about the other resources? What comes back to rebuild the soil? For the system to work we need to give and take – and give back. For the past couple of years, neighbor Kate has shared the (really massive) surplus of her apple tree with us. We turn bushels of apples into sauce, apple pie filling and apple cider vinegar, and we return a portion of that to her. 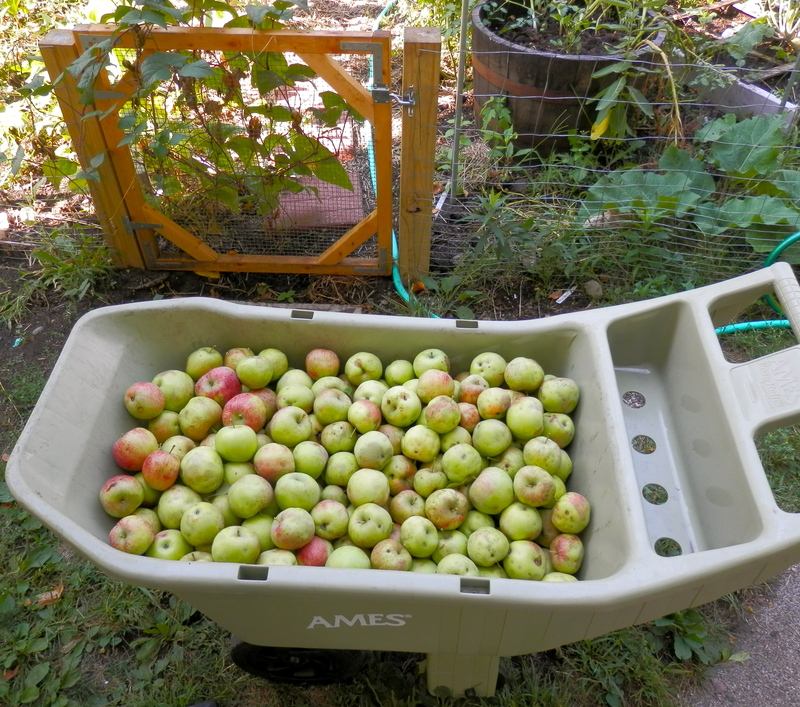 The tree gave and she took; she gave and we took; we gave back and we used the refuse from our processing of the apples to make compost. Permaculture is fundamentally about right relationship. As the earth is generous with us, so we are called to be generous too, not by draining ourselves (or our soil) but by sharing when we have a surplus. We have 1/10th of an acre and only a small portion of that lot can grow food. Between eating fresh in summer and canning vegetables for winter, we can’t produce enough food for our family (we can’t live exclusively on kale). It doesn’t make sense to think of producing surplus food to give away. So if we have a goal of sharing, how would that work best? I always have a lot of cucumbers, which I could exchange with a friend who has a lot of raspberries. 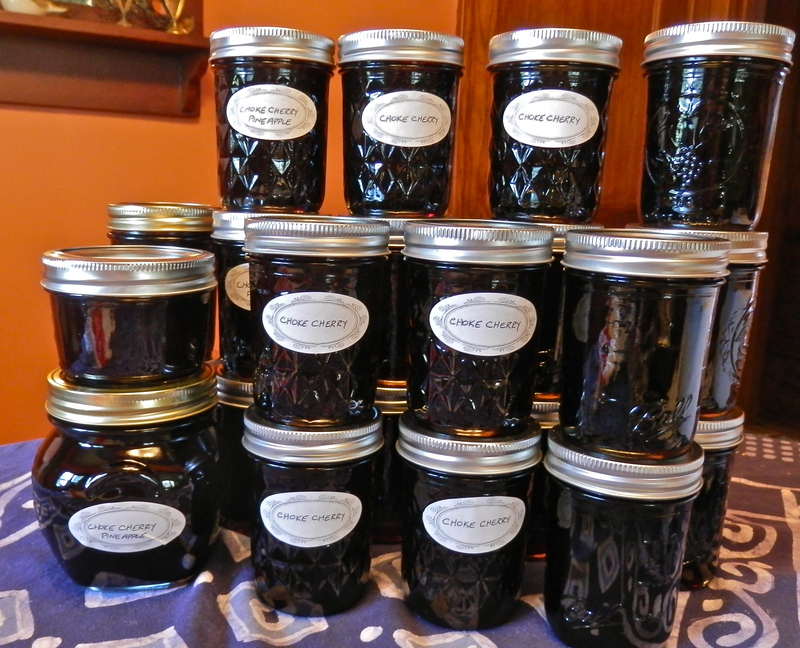 Or I could exchange cans of cucumber pickles for her jars of raspberry jam. That way we get the best of all worlds from our two little lots. I like to share plants. I grow a lot of my plants from seed, starting in February. I successfully raised 150 baby tomato plants last May, but only had room for 75 in the garden. I gave the rest of them away, mostly to people who were new to gardening. It was fun to visit their gardens and see my babies thriving. When children come by and admire the garden, I let them taste whatever is ripe that day – ground cherries, borage flowers, pea pods – and I ask if they’d like to take a chive plant home. Chives are expansive. I always have more than I know what to do with. They are easy to grow and look pretty. They do well with little care so a child is almost guaranteed to be successful growing it. I share my knowledge of gardening. I participate in the monthly food gardening discussion that Transition Longfellow hosts on the first Saturday of every month. I volunteer with Chard Your Yard, helping to install raised bed gardens in the yards of folks in my neighborhood. I volunteer as a mentor to new gardeners. And this year I was accepted into the Hennepin County Master Gardener’s program. I’ll be doing 50 hours of community service as a master gardener in exchange for learning with and from some really knowledgeable teachers. If I had more free time, I could offer to help neighbors who work long hours by watering their plants. Or I could volunteer to weed my elderly neighbor’s vegetable garden because I know how difficult it is for her. Or I could volunteer to help maintain the garden at one of the elementary schools in my neighborhood. Actually, knowing my limits may be one of the hardest lessons I have to learn from permaculture. See Principle 4: Apply self regulation and accept feedback. This entry was posted in Food/gardening, Sharing and tagged gardening, permaculture, sharing. Bookmark the permalink. Dianne – so glad to hear you appreciate it. The discussion group starts at 10:30 am. This year we are talking about plant families – and all things gardening. Leslie! I’m so impressed by this blog! I’ve read everything down to “older posts” and loved it! What time is the 1st Saturday discussion? I’ll be home for the April one and would like to come!